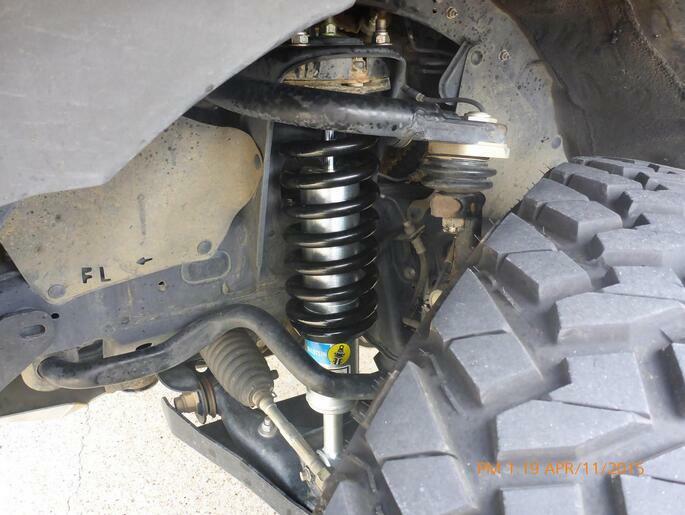 I did the rear shocks in my 94′ F150 4×4, I only did the rear so far because they did have a nother front shock at Auto Zone. Do not cut the wire on the shock yet!!!! Its there to keep it compressed until you put it in!!! Don’t use an impact gun! Only do one side at a time, incase the jack slips on something happens you can lower the truck. 1. Put the parking brake on and jack of the rear of the truck, I did it at the bumper. Jack it enough to were the tires are not off the ground but most of the pressure is off the shocks. 2. Loosen the lower shock bolt and remove it, the shock will stretch out more after you remove it. Then loosen the nut at the top and slide the shock off. 3. Take you new shock and slide the top on first and put the nut back on finger tite. 4. Then line the bottom of the shock up with the lower mount, have the bolt in one hand and snips in the other. Then cut the wire, drop the snips and grab the shock and guide it in place and put the bolt in quickly! 6. Repeat on the other side and lower the truck and your done! I will add how to do the fronts once I get my front shocks in. I did’nt take any pictures because I did’nt think of this till I was done doing it. If you guys have any question ask!